This dog isn't getting out of her owner's sight again. 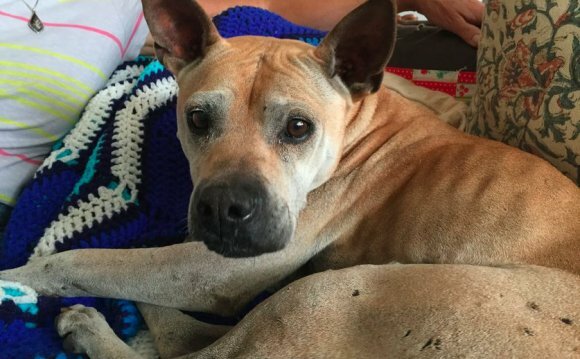 An 8-year-old Shar Pei mix named Georgia made an incredible 35-mile trek to her Carlsbad, Calif., home, nine days after she got separated from her owner in a park. Owner Kris Anderson told the San Diego Union-Tribune the dog simply got lost while chasing some rabbits on June 27, at the Los Penasquitos Canyon Preserve. She spent several fruitless hours searching for Georgia and was crestfallen after authorities told her animal probably wouldn't survive in the coyote-filled region. Still, Anderson, 64, refused to give up hope and continued to visit the area in search of Georgia. The canine gave her an amazing surprise Monday morning when she walked into their house and woke up Anderson, who was asleep in her bed. I was thinking 'what?' 'How could this be? Am I dreaming or is this really happening? Despite some weight loss and scratches on her body, not to mention a journey of several dozen miles or more, the animal was in good shape minus some exhaustion, veterinarian Luis Lizarraga told the newspaper. Shar pei fever syndrome episode.